The cabinet is constructed of Maple Plywood, grain matched all the way around, with Maple face framing. No nails or screws were used in the construction of the carcass. Just daddos and glue. The entire workstation rolls on four locking casters. I did not bother wasting time or space on access to the router from below the table. With the PRL V2, the only reason to touch the router is to adjust the speed or clean it. I pull the router from the top for these operations, on that rare occasion it is necessary. Space is at a premium in my garage so the design was focused on maximizing storage space while keeping everything organized and easy to locate. 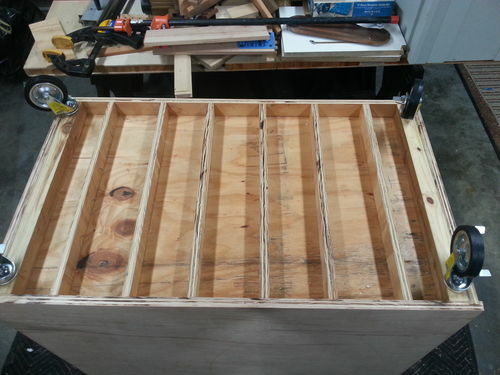 The router bit drawer is two tiered and comes apart for access to the less used 1\4” bits. Dust collection has been upgraded from 2 1/2” port to a 4” and 2” port at the router bit. 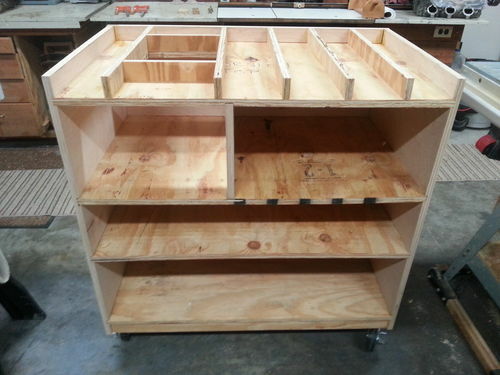 I still have to finish the drawers and will be using many of the Incra joints for the drawers. They will be exposed with no drawer fronts. I will be using Paduak and Hard Maple for the drawers. HDPE for the slides. Your comments and suggestions are welcome, as always. Here are a few more photos of the carcass during construction. A 2” torsion box was built into the top and bottom. really nice. I have a very similar setup with down draft dust collection. Your going to love it. The incra and Woodpecker are so nice! I did wait before getting the dust collection hooked up and wish that I had done it long ago. I see you have it already worked out with your table. Very nice job. And it’s on rolling / locking casters, too. Color me jealous! 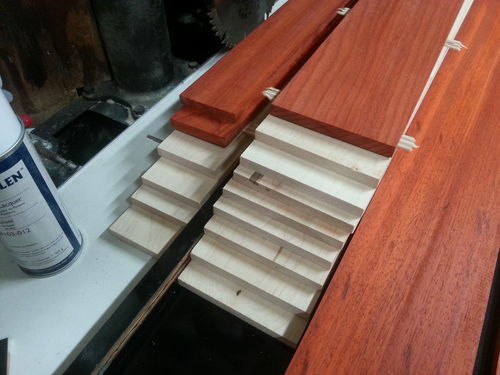 Love your design, especially the two tiered drawer for the router bits. That’s genius! Thanks guys. I really have tried to incorporate all the things people said they wished they had done differently. Having all four wheels that lock is a real plus. My last router table was stationary and a real pain to move. The router drawer was designed to utilize as much space under the table top as possible. I really am limited in what I can keep in my 2 car garage so making the best use of space was a priority. Thanks for the kind words guys. I will post more once the Incra drawers are completed. The second coat of polyurethane goes on this weekend. I’m jealous. Added to my favorites for a “someday” project! Here is a photo of the 5625-20 in the lift. I am glad you guys like it. Just priced some lumber for the drawers and nearly fell out of my chair. Looks very nice. Did you build a blank to cover the router hole when you use the workstation for other things? Just curious why you didn’t go all Incra, and instead went with the woodpeckers table and lift? Oh and awesome job I will definitely be copying this design. I have a blank aluminium plate set that I bought with the router. It covers the hole completely. I do not have the clamping table built yet. 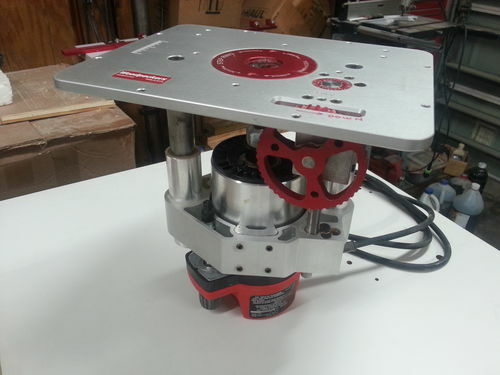 It will be the same size, no router plate hole, and all Kregg track with the new Automaxx bench clamps. The tops will be swappable. When I bought my lift, Incra did not have the rights to the Woodpecker design and there was no Incra PRL V2. I am glad I did because I really like the aluminum inserts for my PRL V2 plate much better. I think they are made of plastic now. Since I was having it all shipped, it was more cost effective to buy it from one source. The Incra Ultra fence has been in my possession for a lot longer. This has been an upgrade that has taken years to realize and was not an overnight upgrade. Thanks for letting me know how much you like it. I am chasing down the lumber for the drawers now so stay tuned. Plopped down my hard earned cash today for some Paduak and Maple. 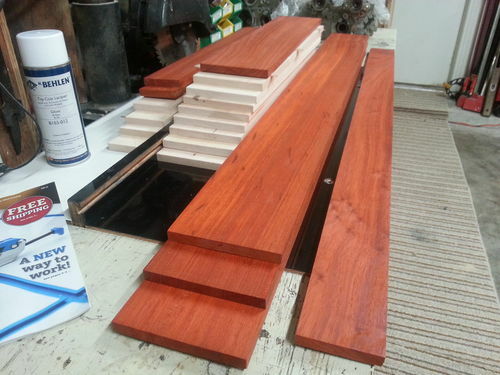 I also bought some Behlen Top Coat Lacquer Gloss for the drawers. I decided to go with Rockler lumber. It was reasonably priced considering that it is already milled. I thought about going with some 4/4 lumber but the cost savings vs. time just did not add up for this project. I figured this was a good project to test a different wood supplier, good or bad. Let me know what your experience has been using Rockler lumber. Any finish suggestions are also welcome. Always looking to learn something from a master. P.S. I finished the router bit drawer. It needed shimming so that it fit perfect in the face frame opening. 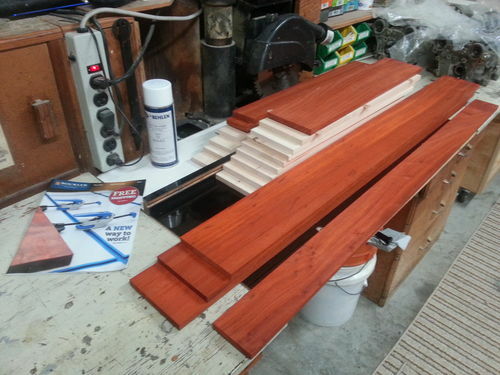 I still am not sure if I will leave the bit drawer and door in Maple or use the left over Padauk to make it all match. I think that the contrast of the upper quadrant may look good in Maple against the Paduak. I am flexible and will get it sorted, one way or the other. I do not know about you guys, but I really get really excited when I get a new batch of timber to whittle on. Especially when I get to use some exotic wood that I have never used before. I almost went with the Walnut, just because I have used it many times before. There is comfort in that. But, I wanted to do some experimenting while I can. This is going to sit in my garage. This is not fine furniture, like I usually work on. 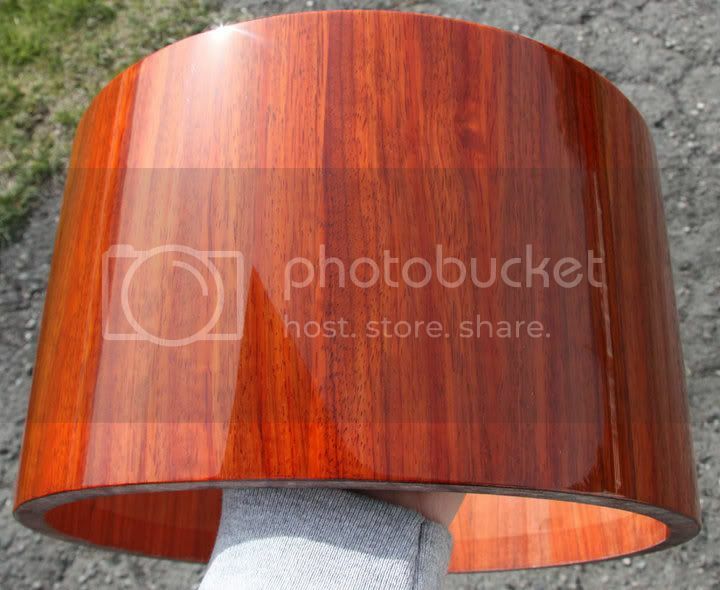 So, if the wood gives me issues or the spray lacquer I want to try does not work out, well, it will not be noticed by anyone except probably me. So, here is what! the UPS man left me today! I have not had a chance to put a moisture meter to it but I think I will take some reading and let the wood sit shimmed for a week in the garage (yeah, I know, another week…....), just to see how things go. The humidity is so high here on the water that I would rather wait then mess up a bunch of good timber. 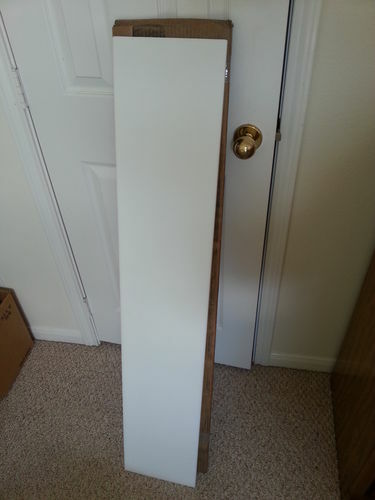 I am still waiting on some things to complete the assembly top so I can use it to put the drawers together but I did receive the HDPE (High Density Poly Ethelyne – cutting board material) for the drawer slides. Since there will be no drawer faces, I can not use a conventional drawer slide. This material should facilitate their smooth operation.